Her yaz An illustration of the electrolyte solution used in the new study, on the atomic scale. 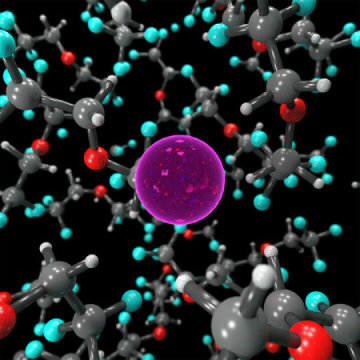 The fluoride ion (pink) is surrounded by a liquid of BTFE molecules. Imagine not having to charge your phone or laptop for weeks. That is the dream of researchers looking into alternative batteries that go beyond the current lithium-ion versions popular today. Now, in a new study appearing in the journal Science, chemists at several institutions, including Caltech and the Jet Propulsion Laboratory, which is managed by Caltech for NASA, as well as the Honda Research Institute and Lawrence Berkeley National Laboratory, have hit on a new way of making rechargeable batteries based on fluoride, the negatively charged form, or anion, of the element fluorine. "Fluoride batteries can have a higher energy density, which means that they may last longer -- up to eight times longer than batteries in use today," says study co-author Robert Grubbs, Caltech's Victor and Elizabeth Atkins Professor of Chemistry and a winner of the 2005 Nobel Prize in Chemistry. "But fluoride can be challenging to work with, in particular because it's so corrosive and reactive." In the 1970s, researchers attempted to create rechargeable fluoride batteries using solid components, but solid-state batteries work only at high temperatures, making them impractical for everyday use. In the new study, the authors report at last figuring out how to make the fluoride batteries work using liquid components -- and liquid batteries easily work at room temperature. "We are still in the early stages of development, but this is the first rechargeable fluoride battery that works at room temperature," says Simon Jones, a chemist at JPL and corresponding author of the new study. Batteries drive electrical currents by shuttling charged atoms -- or ions -- between a positive and negative electrode. This shuttling process proceeds more easily at room temperature when liquids are involved. In the case of lithium-ion batteries, lithium is shuttled between the electrodes with the help of a liquid solution, or electrolyte. "Recharging a battery is like pushing a ball up a hill and then letting it roll back again, over and over," says co-author Thomas Miller, professor of chemistry at Caltech. "You go back and forth between storing the energy and using it." While lithium ions are positive (called cations), the fluoride ions used in the new study bear a negative charge (and are called anions). There are both challenges and advantages to working with anions in batteries. "For a battery that lasts longer, you need to move a greater number of charges. Moving multiply charged metal cations is difficult, but a similar result can be achieved by moving several singly charged anions, which travel with comparative ease," says Jones, who does research at JPL on power sources needed for spacecraft. "The challenges with this scheme are making the system work at useable voltages. In this new study, we demonstrate that anions are indeed worthy of attention in battery science since we show that fluoride can work at high enough voltages." The key to making the fluoride batteries work in a liquid rather than a solid state turned out to be an electrolyte liquid called bis(2,2,2-trifluoroethyl)ether, or BTFE. This solvent is what helps keep the fluoride ion stable so that it can shuttle electrons back and forth in the battery. Jones says his intern at the time, Victoria Davis, who now studies at the University of North Carolina, Chapel Hill, was the first to think of trying BTFE. While Jones did not have much hope it would succeed, the team decided to try it anyway and were surprised it worked so well. At that point, Jones turned to Miller for help in understanding why the solution worked. Miller and his group ran computer simulations of the reaction and figured out which aspects of BTFE were stabilizing the fluoride. From there, the team was able to tweak the BTFE solution, modifying it with additives to improve its performance and stability. "We're unlocking a new way of making longer-lasting batteries," says Jones. "Fluoride is making a comeback in batteries."